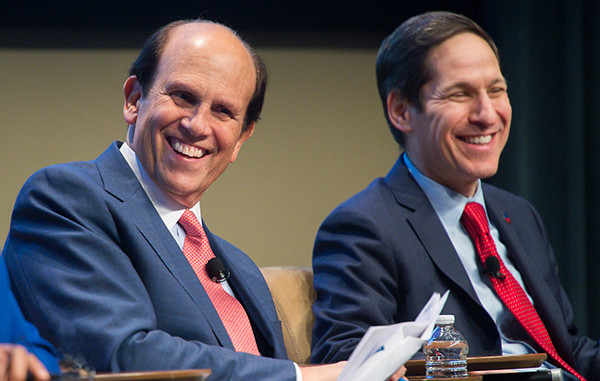 Mike and Dr. Tom Frieden, director of the U.S. Centers for Disease Control and Prevention, welcome participants to the Summit on Prosperity and Public Health, hosted by the Milken Institute and the CDC Foundation. A group of more than 200 health, business and philanthropic leaders braved a snowstorm that shut down the city of Atlanta to reaffirm America's commitment to public health. An extension of the Celebration of Science initiative, topics included the CDC response to global health threats; collaboration among industry, universities, philanthropists and foundations, and government agencies to improve public health; the economic impact of chronic disease; and the increasing challenge of staying ahead of life-threatening infections through advanced molecular detection.